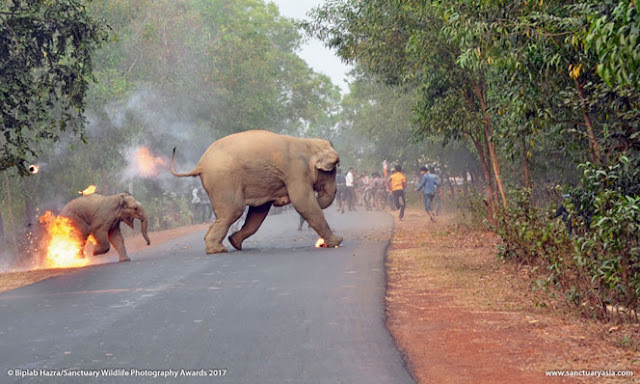 An image of two elephants fleeing a mob that set them on fire in eastern India highlights the ongoing human-elephant conflicts in the region.The photograph, titled “Hell Is Here,” was taken by Biplab Hazra and was named the winner of the Sanctuary Wildlife Photography Awards 2017. The image shows a calf on fire as it and an adult elephant run for their lives — as a crowd of “jeering” people throws “flaming tar balls” and firecrackers at the pair. According to the Sanctuary Asia Foundation, these types of scenes are common in the Bankura district of West Bengal. “The ignorance and bloodlust of mobs that attack herds for fun, is compounded by the plight of those that actually suffer damage to land, life and property by wandering elephants and the utter indifference of the central and state government to recognize the crisis that is at hand,” the magazine said in a note accompanying the photograph. India is home to over 70 percent of the global population of Asian elephants, but the region has often been in the news for human deaths caused by encounters with elephants. In March of this year, forest officials in West Bengal’s Bankura district started issuing SMS alerts about the movement of elephants to prevent man-animal conflicts that killed 29 people last year, the Hindustan Times reported. In February 2016, a wild elephant went on the rampage through a town in east India, smashing cars and homes before being tranquilized and returned to the forest. The elephant had wandered from the Baikunthapur forest, crossing roads and a small river before entering the town in search of food, Basab Rai, a divisional forest officer in the area, told the Associated Press at the time. While it’s unclear what eventually happened to the two elephants in the award-winning picture, the dramatic image highlights how elephant-human conflicts are escalating. “For these smart, gentle, social animals who have roamed the subcontinent for centuries, hell is now and here,” the magazine said.